Do you have everything you have always dreamed of—healthy children, a nice home, a loving partner… and still feel crappy? Do you bicker with your significant other, snap at the kids and reach for the wine more than you would like? Do you feel anxious, rushed and overwhelmed every single day? This book is full of wisdom from top personal development gurus, positive psychology researchers and families who use these tools. It shows how a few simple tweaks to your mindset, language and physiology have the power to take your daily life from crappy to happy. It also cuts through the confusion around meditation, provides compelling reasons why a gratitude practice is a game changer and explains the three tiers to ultimate happiness and fulfillment. This is a clear, gimmick-free guide for mamas and others who should be feeling on the top of the world but are not. In less than a couple of hours this book gives you dozens of no- or low-cost, easy and practical tips for feeling less stressed, less irritated and less worried. You may not believe it now, but you will start to feel more calm, positive and full of joy. I am a wife, a mama of two young kids and a lifelong learner of personal development. And I am sick of feeling crappy! So I distilled an avalanche of advice from books, articles and seminars into simple and practical tips to help mamas just like you and me rediscover our inner wisdom and remember how to love our lives. Read this book and you won’t need to spend hours searching for information all over the Internet. 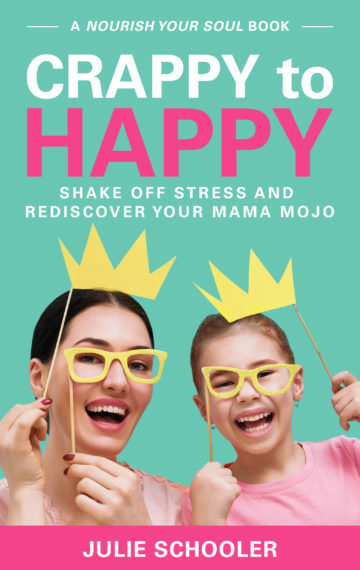 If you use even a couple of the tools in this book, you will feel better, family times will be enjoyable again, and you will give your children the best gift of all—a happy mama. What’s stopping you from feeling more relaxed and cheerful today? Get your copy from Amazon today and you WILL transform from crappy to happy. Crappy to Happy is part of the Nourish Your Soul series that shares delicious wisdom to help readers feel calmer, happier and more fulfilled.